Major announcements are on tap from Home Depot, Monster Beverage, and Fitbit. 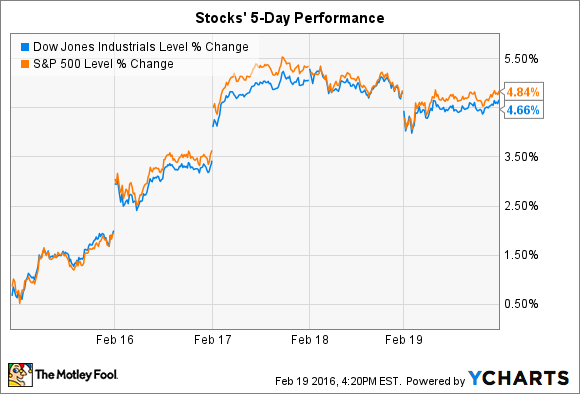 Stocks had their strongest five-day stretch of the year last week, with the Dow Jones Industrial Average (DJINDICES:^DJI) and S&P 500 (SNPINDEX:^GSPC) each gaining nearly 5%, and cutting their year-to-date losses almost in half. The next five trading days could be just as volatile, as hundreds of earnings reports will be announced before Friday evening. Below, I'll highlight three of the biggest reports for investors to watch this week, from Fitbit (NYSE:FIT), Home Depot (NYSE:HD), and Monster Beverage (NASDAQ:MNST). Wearable-technology maker Fitbit will post its holiday-quarter numbers on Monday afternoon, and Wall Street isn't optimistic about the results: The stock is down 45% during the past 90 days. The Blaze activity tracker. Source: Fitbit. That's surprising given that third-quarter trends were so strong. Fitbit sold nearly 5 million connected health and fitness devices in that period, which powered a 168% Q3 sales spike. Revenue is likely to have jumped again for the holiday quarter, but the company will have to show that recent innovations like the Surge, Charge HR, and Blaze tracker can stand out in an increasingly crowded wearable-tech space. CEO James Park forecast that Fitbit will generate between $620 million and $650 million of sales in Q4, and consensus Wall Street projections are at the high-end of that range. Besides revenue, investors should keep an eye on profitability, which should come in at around 48%, assuming Fitbit didn't have to resort to huge price cuts to keep its wearable devices flying off the shelves. Home Depot was one of the Dow's best-performing stocks in 2015, yet it's trailing the market heading into its Q4 earnings report due out on Tuesday morning. Consensus estimates forecast 6% higher sales and a 10% profit spike for the home-improvement giant. Home Depot's comparable-store sales growth spiked to 7.3% last quarter as customers flooded its aisles, with help from a steadily improving housing market. Yet the retailer is getting more than its fair share of that growing industry -- it beat rival Lowe's on the key metrics of sales growth, customer traffic, and profitability. Investors will be looking for continued market-beating traffic gains in Q4. They'll also be listening closely for updated commentary regarding how executives see the housing market growing in 2016. 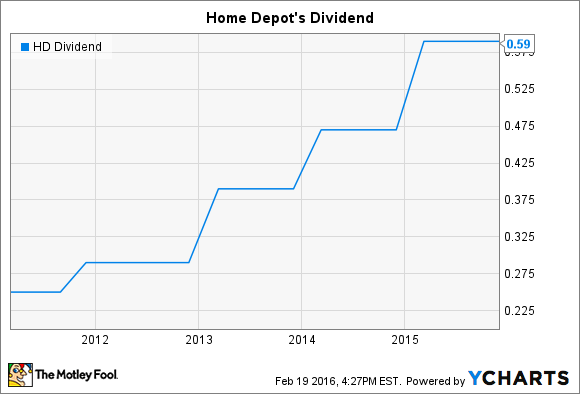 HD Dividend data by YCharts. Finally, watch for a significant dividend hike out of management this week. Home Depot announced a 26% and 21% payout boost in its Q4 announcements for 2014 and 2013, respectively. Energy drink giant Monster Beverage will announce Q4 earnings after the market closes on Thursday. Consensus estimates call for the company to post 15% higher sales, and a 13% profit jump for the holiday quarter. That result would far outpace established drink titan Coca-Cola, which recently announced an 8% Q4 revenue decline. Yet Monster's market-thumping growth would still mark a big slowdown from last quarter's blowout profit gain. The company's supply agreement with Coca-Cola helped push distribution expenses down 22%, and allowed gross profits to soar to 62% of sales from 54% a year ago. The deal will also be key to Monster's gaining access to international markets like Russia last quarter, and China in the first half of this year. Look for CEO Rodney Sacks to talk up the company's international expansion plans on Thursday.